Sounds of wonderment and appreciation were heard from toddlers to seniors as the moon passed over the sun and science, math, engineering and technology were creatively displayed on Monday, Aug. 21 at Southern Illinois University Edwardsville East St. Louis Center’s (ESLC) solar eclipse celebration. 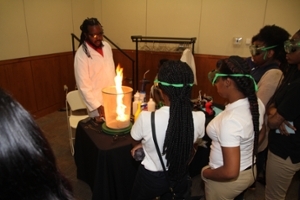 Approximately 600 people convened at the East St. Louis Higher Education Campus to enjoy the campus-wide STEM Day, Energy to Educate Showcase and Solar Eclipse Celebration, which was broadcast live on HOT 104.1 FM Radio. The day also included bounce houses and a drone demonstration. The event was coordinated by the SIUE East St. Louis Learning Resource Center (LRC) and funded in part by a grant from Constellation, an Exelon company, designed to inspire students to think differently about energy. Of those attending Monday’s educational event, 100 students were from Lincoln Middle School in East St. Louis and 130 students and staff were from the SIUE East St. Louis Charter High School (CHS). Streater and friends then moved to the next display where other students were crowded around the CHS table. Johnathan Tate, acting STEM department chair at CHS, informed students that when boric acid is added to flammable fuel, it turns the fire green. On the other side of the room, a two-year-old Head Start student and two other children were digging in dirt with gardening tools at the Upward Bound station. “This event had STEM-related education and activities for everyone who attended,” said G. Lynnie Bailey, SIUE Head Start/Early Head Start program director. “I liked how the corona stood out as the moon began to pass over the sun,” said 15-year-old Al Pollard, a freshman at Belleville West High School. “I want to get into the science field. I like science because it deals with the ‘whys’ in life. 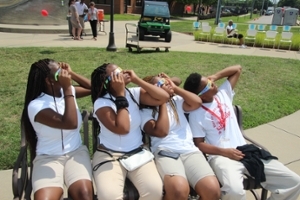 SIUE East St. Louis Charter High School students protect their eyes as they watch the solar eclipse on Monday, Aug. 21. Johnathan Tate, acting STEM department chair at CHS, explains to students how boric acid can turn flammable fuels into green fire. 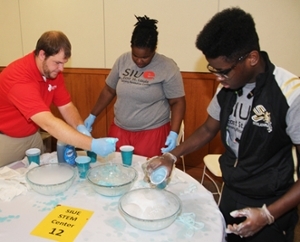 Matt Johnson, instructional design and curriculum specialist with the SIUE STEM Center, tells students about the reactions of dry ice.